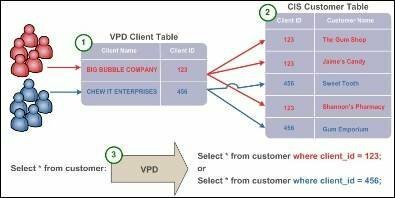 In this third part of a series on Oracle database consolidation, contributor Jeff McCormick explains how the Oracle Virtual Private Database (VPD) can promote and encourage Oracle database consolidation. in Oracle Database, and therefore encourage Oracle database consolidation. Oracle VPD enables data access controls at the row and column level of tables and views. At first glance, the name VPD is a bit misleading. After all, the Oracle database is already a multi-user database with each user unaware they are sharing the database with other users. It would be more accurate to call this feature Virtual Private Schema Object (VPSO) as it virtualizes tables, views and synonyms within the database. But for the purpose of this article, we’ll call it a VPD. Whereas Oracle’s user/role security privilege model grants access to schema objects, VPD enforces fine-grained access of schema object data through access policies. Once access policies are in place, VPD dynamically modifies SQL statements such as SELECT, UPDATE and INSERT by simply appending a WHERE condition to filter the results. VPD is not only transparent to users; its security cannot be bypassed. Best of all, it is a free option with the Oracle Database Enterprise Edition. The following VPD use case will show how to store multiple companies' data within the same schema without them knowing about it. The ABC Gum Company has an opportunity to cash in on a number of startup companies looking to hit the market quickly using hosted business systems. They decide to offer their Customer Information System (CIS) as a centrally hosted Internet application and data service. For this cloud-based Software as a Service (SaaS) delivery model to be successful, they must engineer a solution that has no changes to their existing application code, provides data security, allows rapid provisioning and maximizes return on investment (ROI). The team dismisses deploying separate databases for each client, realizing this strategy won’t meet all the requirements. They consider sharing a single database. One of their top DBAs suggests Oracle’s VPD to store multiple clients’ data within the same database schema. He explains VPD would be transparent to the application, provide row-level data security, meet the agility needs of the sales team and be the most cost-effective deployment strategy. He describes how clients will be unaware that they’re sharing the same schema objects. He goes on to describe how the primary components of the design would be implemented (listing 1). First, he explains that users would continue to connect to the database through the existing Web application by using client-specific connection pools as a proxy on behalf of the users. An application context would be set when database sessions are established, effectively caching a client identifier attribute. A security access policy, based on a policy function, would be applied to schema objects enforcing logical separation of client data. The policy function would use the application context and a client identifying column to return a predicate, limiting row access to CIS tables, views and synonyms. That’s it. The VPD would now dynamically add the predicate to each query, effectively filtering each client’s data (Listing 2).